So what if Ryan disagrees with Trump on some issues? What matters is Ryan's commitment to back Trump if he’s nominated. Paul Ryan is supposed to be the responsible adult in a room full of immature and belligerent Republicans. As the speaker of the House, as the party’s immediate former nominee for vice president, as a frequently boomed prospect for the presidency himself, Ryan has the authority and the stature that most of the party’s presidential candidates lack. 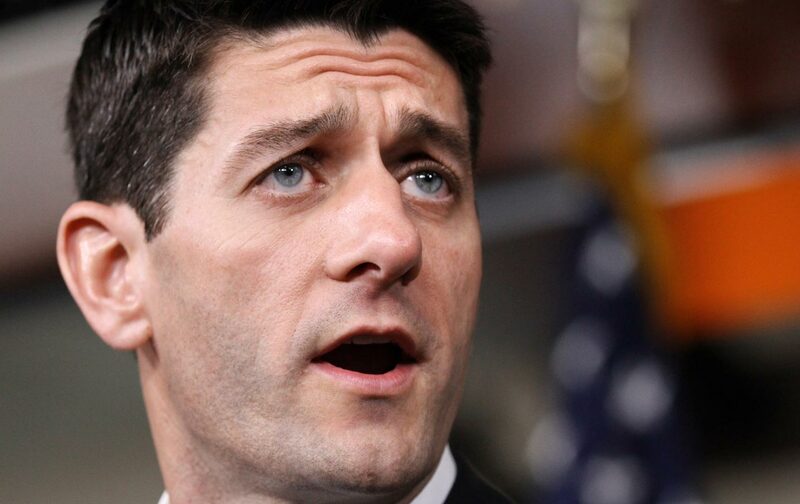 It is Ryan who should be drawing a line and saying that Republicans are on one side and Donald Trump is on the other. Yet, after Trump called for an indiscriminate “total and complete shutdown” of Muslims entering the United States—in the latest expression of his xenophobia and bigotry—Ryan sounded like an indulgent parent talking about a troublesome child. “Normally, I do not comment on what’s going on in the presidential election. I will take an exception today,” Ryan said on Tuesday, as a firestorm rose regarding Trump’s crude extremism. Even if Trump is “not what the party stands for,” Ryan says he’ll back Trump if he is nominated. All true. And it was clear Ryan was talking about Trump—even if the speaker lacked the wherewithal to call out the billionaire by name. There is no question that Trump’s religious-test bigotry is at odds with the basic premises of the US Constitution and what this country has stood for at its best. There is some question about whether Trump’s extremism is at odds with the conservatism that is now practiced by a good many Republicans and much of the party’s media echo chamber. But Ryan says it’s “not conservatism,” so that’s cool. There is also some question about whether Trump’s extremism is at odds with what the Republican Party now stands for—as a lot of the party’s base seems to be rallying around Trump, and as the party’s establishment continues to provide him with forums to promote discrimination against people based on their religion and national origin. But Ryan says it’s “not what this party stands for,” so that’s good. Unfortunately, Ryan does not believe what he says sufficiently to break with Trump. So, just to be clear, Ryan does not think that Trump is advocating for conservatism. And Ryan does not think that Trump represents what the Republican Party stands for. But Ryan would back Trump for president of the United States. That is not, as some headline writers suggest, “withering fire” directed at Donald Trump. That is certainly not leadership. At best, Ryan sends a mixed message. And that mixed message, criticism followed by a commitment to support a “not what this party stands for” nominee, aids and abets Trump. In effect, it says that, even if Trump does not represent what Republican elites stand for at this point, the party’s supposedly sober and responsible leaders will stand for Trump if he is nominated.